Click HERE to screen the FRONTIER trailer. TORONTO, Oct. 12, 2016 /CNW/ - FRONTIER, Discovery Canada's riveting new drama, makes its worldwide debut Sundays at 9 p.m. ET/6 p.m. PT, beginning Nov. 6. Ambitiously cinematic in scope, the network's first-ever scripted series shot entirely in stunning 4K UHD follows the chaotic and violent struggle to control wealth and power in the North American fur trade of the late 18th century. 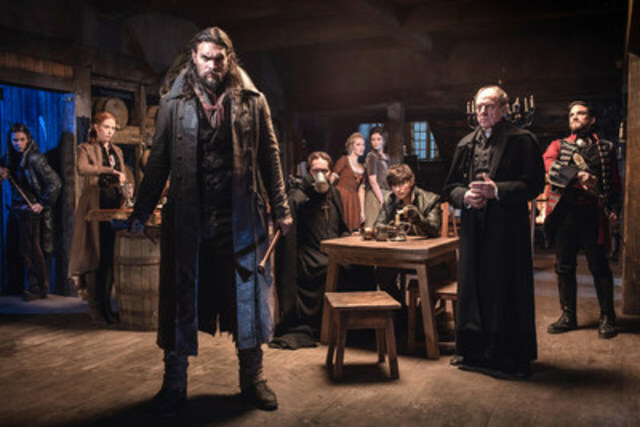 The gritty series' star-studded international cast is led by action star Jason Momoa (GAME OF THRONES, Justice League), Landon Liboiron (HEMLOCK GROVE, DEGRASSI), Alun Armstrong (NEW TRICKS, Braveheart), Zoe Boyle (DOWNTON ABBEY, SONS OF ANARCHY), Allan Hawco (REPUBLIC OF DOYLE), and Jessica Matten (A Red Girl's Reasoning). Unabashedly true to its time period, the six-part series offers viewers the raw beauty and cutthroat power struggle of the fur trade, portraying a world of unfettered ferocity. Click HERE for descriptions of all six episodes. "As one of the largest undertakings in Canadian television history, and certainly the largest for Discovery as we open a new chapter for the brand, FRONTIER is set to become destination viewing for Canadians from coast-to-coast-to-coast," said Ken MacDonald, Vice-President and General Manager, Discovery. "We are extremely proud to develop and bring such an important time in our country's history to life for Canadian audiences – and indeed, audiences around the world as a result of our partnership with Netflix - complete with the meticulous authenticity and world-class production quality that it deserves." Discovery's broadcast of FRONTIER is sponsored by Samsung Canada, the exclusive 4K UHD TV partner. The series is commissioned by Discovery Canada and shot in St. John's, Nfld., Louisbourg, N.S., and Cornwall, U.K., providing the stunning backdrop for this premium, beautifully vivid 4K UHD drama series. Following each television premiere, episodes of the groundbreaking series will be available on the Discovery GO app. Set against the stunning, raw backdrop of 1700s Canada, FRONTIER is a thrilling action-filled series revolving around warring factions vying for control of the fur trade in a ruthless game of wealth and power. Irish stowaway Michael Smyth (Liboiron) has barely stepped foot in the New World when he becomes embroiled in a dangerous battle between the fearless and violent Declan Harp (Momoa), and the formidable Lord Benton (Armstrong) of the Hudson's Bay Company. A dramatic story of revenge and riches, betrayal and brutality, and survival of the fittest in the James Bay fur trade, FRONTIER's rich and raw cast of characters are all gunning to be the last man standing – from the combustible Scottish Brown Brothers (Hawco, Michael Patric, Stephen Lord), to crafty ale house owner Grace Emberly (Boyle), to treacherous Captain Chesterfield (Evan Jonigkeit), and rich America entrepreneur Samuel Grant (Shawn Doyle). All are willing to do whatever it takes to hold the keys to the kingdom of the New World. FRONTIER is co-created by Rob and Peter Blackie, and produced by Take The Shot Productions and ASAP Entertainment, in association with Discovery, the exclusive Canadian broadcaster. Netflix is the international broadcast partner. Edwina Follows is Executive Producer for Discovery, and Ken MacDonald is Vice-President and General Manager, Discovery. Tracey Pearce is President, Distribution and Pay, Bell Media. Randy Lennox is President, Broadcasting and Content, Bell Media. For Take The Shot Productions, Alex Patrick, John Vatcher, Rob Blackie, Peter Blackie, Allan Hawco, Perry Chafe, and Michael Levine are Executive Producers. For ASAP Entertainment, Brad Peyton and Jeff Fierson are Executive Producers. Bell Media has commissioned some of Canada's most-watched and most-acclaimed original programming, working with the best Canadian independent producers in the country. Hit series commissioned by CTV include ratings success stories SAVING HOPE, and the record-breaking THE AMAZING RACE CANADA, and MASTERCHEF CANADA. Upcoming original series on CTV include CARDINAL and THE DISAPPEARANCE. Among the original scripted series on Bell Media pay, specialty, and streaming platforms are the internationally acclaimed ORPHAN BLACK, Space's most-watched original series KILLJOYS, Bravo's award-winning and most-watched original drama 19-2, award-winning dramedy SENSITIVE SKIN, CraveTV's first original series LETTERKENNY, the upcoming original series RUSSELL PETERS IS THE INDIAN DETECTIVE, Discovery's upcoming drama FRONTIER, and Comedy's new satirical news series THE BEAVERTON. Discovery is also home to Bell Media's hit factual series HIGHWAY THRU HELL, COLD WATER COWBOYS, and CANADA'S WORST DRIVER, among others. Bell Media is one of the first media companies in North America to commit to producing all new scripted series in 4K. ASAP Entertainment is the feature film and television production company founded by writer/director Brad Peyton and his producing partner Jeff Fierson. Peyton directed the Warner Bros. hit film San Andreas, which has earned more than $470 million at the worldwide box office and remains the top grossing wholly original live-action film of 2015. Upcoming features include New Line Cinema's Rampage, based on the 1980s arcade game and starring Dwayne Johnson, which Peyton will direct and produce and Fierson will executive produce. Additionally, ASAP Entertainment has set-up Malignant Man at Fox, and an untitled high-concept action/adventure feature for Sony Pictures Entertainment, for Peyton to direct and executive produce, alongside Fierson. In addition to FRONTIER, ASAP Entertainment continues its growth in the television space with FIRST RESPONDERS, a procedural drama in development at NBC, executive produced in partnership with Vin Diesel and his One Race Films banner. Established in 2009, St. John's based Take The Shot produces a variety of scripted and unscripted projects for television. Past and current productions include the Gemini-nominated series REPUBLIC OF DOYLE, now airing in over 100 countries; the hit factual series MAJUMDER MANOR; BOY ON BRIDGE featuring Great Big Sea's front man Alan Doyle, HBO Canada's SHAUN MAJUMDER, EVERY WORD IS ABSOLUTELY TRUE, and FRONTIER for Discovery Canada and Netflix in other markets. With compelling real-life programming that inspires and entertains, Discovery reveals the world in all its wonder, diversity and amazement. Discovery ranks as the #1 Canadian entertainment specialty network for reaching total viewers and all the adult demos. Discovery offers a signature mix of adrenaline-charged stories, larger-than-life personalities and vivid imagery for viewers with curious minds. With the best non-fiction programming from Canada and around the world, Discovery captures the excitement of a passion for life – one lived fully and at its most extreme. With exceptional and immersive storytelling, the channel offers in-depth, behind-the-scenes glimpses at the extraordinary people and places that shape our world. Launched in Canada in 1995, Discovery is now available in more than eight million Canadian homes. Discovery Canada is a joint venture between Bell Media, which is owned by BCE Inc. (TSX, NYSE: BCE), Canada's largest communications company, and Discovery Communications Inc. Find more information and interactive online features at Discovery.ca.